Love is in the air and this month's Visiting Teaching gift is sure to make your visiting teaching visits a little more "lovely!" The message from the February Ensign is entitled, "Marriage is Ordained of God." One of the quotes from the message says, "Now consider what happens in the relationship between the man and the woman as they individually and steadily ‘come unto Christ’ and strive to be ‘perfected in Him’" and we have used "Come Unto Christ with All your Heart" as the title to our gift. 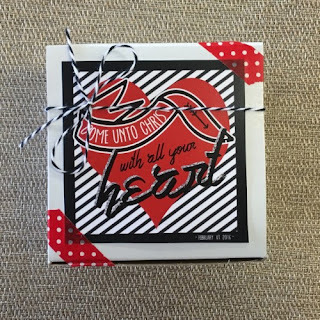 You'll get a white 4"x2"x2" box filled with the message itself and approximately 1.5 oz of milk chocolate Hershey Kisses. We've wrapped it up with a darling tag, a little polka dot washi tape, and a black ribbon. Just lovely, if we do say so ourselves! Happy February!